"Every time I learn something new about the music, I then bring [that] into the next performance," Hilary Hahn says. That album, of two partitas and one sonata by Bach for solo violin, effectively launched Hahn's career. She's since won three Grammys, routinely performs with the world's finest orchestras, plays with pop and electronic musicians and has appeared on TV. But there has been some unfinished business. Hahn says audiences have been hounding her to record the rest of the set of Bach's sonatas and partitas. 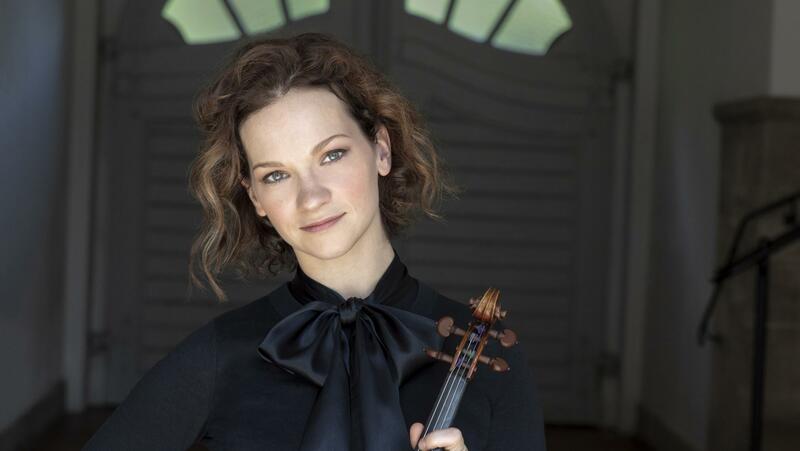 Now, she's done just that on her latest release, Hilary Hahn plays Bach: Violin Sonatas Nos. 1 & 2; Partita No. 1. Hahn returned to Weekend Edition to speak with NPR's Lulu Garcia-Navarro about her new album, returning to her first musical love and learning to appreciate the tough days. Listen to the conversation at the audio link and read interview highlights below. There's something about this music that seems to change the mood of a room, and everywhere that I play it, it works. And I've played it for parents with babies, I've played it in concert halls around the world, I've played it for knitting circles while they were sitting there knitting, I've played it at weddings, and memorial services. Every time I learn something new about the music, I then bring [that] into the next performance. Kids would come up to me after concerts and give me drawings they'd made of violins, or landscapes with a violin floating in it, or some sketch of the concert, or a portrait of me. What I find really interesting is, whenever you see the person who gives you the portrait of yourself, the portrait seems to be a combination of their face and your face. So, whatever variety you see in the portraits that are on my website, or the things that have been made of me, you can just imagine what that person looks like. So in that sense, I feel like they're giving me a part of themselves. I didn't really start it with a purpose, for making a point or to demonstrate anything in particular. I would practice and I would just run the video ... I just kept doing it, kind of for myself, but then I started getting feedback from people that they felt like it brought practice into a communal space. When I was in conservatory, people practiced in the next room, but even then you're not supposed to watch. You're not really supposed to look in the window. You're not supposed to stop and listen, and spy on people practicing. It's supposed to be a private thing. But it's when you come face-to-face with yourself, and you look for your flaws and you try to fix them yourself, it's a really intimidating process. It can be very discouraging so I do think it's important that people feel like there is a community of practicers out there. We're all going through the same process. I've learned that just because you're having a tough day doesn't mean you're not making progress. The tough days are actually when you're making the most progress because you're trying the most things, you're pushing against that wall that you haven't broken through before and eventually you will break through because you're pushing against it. Over two decades ago, a then-17-year-old violinist made her extraordinary recording debut. She came on our program in 1997 to tell us about her album, "Hilary Hahn Plays Bach." HILARY HAHN: There's nothing I really wanted to record more than Bach. It's wonderful music. It's - on a grand scale, there's a lot to it. There are - I can work on it for a long time and keep discovering more things, you know, that surprise me every time. GARCIA-NAVARRO: Hahn recorded two partitas and one sonata by Bach for solo violin, and a star was born. She's since become a three-time Grammy winner, has played with the world's major orchestras, performed with pop stars, appeared on TV. But there has been some unfinished business. She says audiences have been hounding her to record the rest of the set of Bach's sonatas and partitas. And now she's done that with her latest release on Decca Records. GARCIA-NAVARRO: Hilary Hahn joins us now. Welcome back to the program. It's been a while. HAHN: Thank you. It's really good to be back. GARCIA-NAVARRO: So what makes you come back to the music of Bach? What is it that draws you back every time? Because you've done Brahms, Stravinsky. People have written music for you. HAHN: It's hard to describe. There's something about this music that seems to change the mood of a room. And everywhere that I play it, it works. And I've played it for parents with babies. I've played it in concert halls around the world. I've played it for knitting circles while they were sitting there knitting. And I've played it at weddings and memorial services. Every time, I learn something new about the music that I then bring into the next performance. GARCIA-NAVARRO: I think you've - you know, doing something as well as you do requires a great deal of practice. And you are constantly learning. And I want to play the sound of you practicing. Here it is. GARCIA-NAVARRO: You have created an Instagram feed called 100 days of practice showing you practicing every day, which I think is awesome. Why did you do it? And what's been the reaction? HAHN: I've never heard myself practice on the radio. GARCIA-NAVARRO: Right - there's no commentary. GARCIA-NAVARRO: You're not explaining anything. HAHN: I'm not teaching or anything like that. I could see what I wanted to work on more that day or what I wanted to work on the next day. So I just kept doing it kind of for myself. Then I started getting feedback from people that - they felt like it brought practice into a communal space. And, oh, you practice, too. It's kind of like how I practice. GARCIA-NAVARRO: ...On something over and over again. HAHN: If you think about it - if you watch a gymnast compete, you don't see their training behind the scenes. You just see the competition. You see the final result when it's polished. And that is very much what people experience with concerts. They go to the concert. And they see the final version. But there is all this stuff that goes into it that's rough. And, you know, it's building the process. It's experimentation. You know, when I was in conservatory, there would be people practicing in the next room. But even then, you're not supposed to watch. You're not really supposed to look in the window. You're not supposed to stop and listen and spy on people practicing. It's supposed to be a private thing. But it's when you come face-to-face with yourself and you look for your flaws and you try to fix them yourself, it's a really intimidating process. It can be very discouraging. So I do think it's important that people feel like there is a community of practicers out there. And we're all going through the same process. But I've learned over the years that just because you're having a tough day doesn't mean you're not making progress. The tough days are actually when you're making the most progress because you're trying the most things, you're pushing against that wall that you haven't broken through before. And eventually, you will break through because you're pushing against it. GARCIA-NAVARRO: ...Do people give you? That's amazing. HAHN: Kids would come up to me after concerts and give me drawings they've made of violins or, you know, landscapes with a violin floating in it or some sketch of a concert or a portrait of me. And what I find really interesting is whenever you see the person who gives you the portrait of yourself, the portrait seems to be a combination of their face and your face. HAHN: So whatever variety you see in the portraits that are on my website or the things that have been made of me, you can just imagine what that person looks like. So in that sense, I feel like they're giving me a part of themselves, even if it's a piece of art. GARCIA-NAVARRO: Before we say goodbye, I wanted to ask if there is a particular movement from a sonata or a partita on your new album you're particularly fond of that you'd like to hear as we go out? HAHN: I love the andante from the A minor sonata. It's something that I've played in a lot of meaningful contexts for me. And whenever I play it, whenever I hear it, it just feels like it's illustrating life. There's a pulse to it that's like a heartbeat. And there is an inevitability to every phrase, but yet there's freedom within it. GARCIA-NAVARRO: Just beautiful - Hilary Hahn, it's been a pleasure speaking with you. Thank you so much. (SOUNDBITE OF HILARY HAHN'S PERFORMANCE OF BACH'S "SONATA FOR VIOLIN SOLO NO. 2 IN A MINOR") Transcript provided by NPR, Copyright NPR.